David was in crisis. By the age of 15 he had seen as many different placements as birthdays. Each time the story was the same: After a few days in a new home something would set David off. He would become violent; kicking at whatever, or whoever, was in his way, forcing his caregivers to surrender him back to the state. David was running out of time. In a few years he would age out of a system that couldn’t find a place for him, landing in a world without the tools to cope with his own anger much less those needed to support himself. The likely outcome was homelessness or incarceration. Bit of Hope Ranch was David’s last resort. Meg Vanderbilt founded the ranch in 2008 and has served as its Executive Director ever since. As a teacher native to Gaston County with an extensive background working with horses, her vision was to create a place that fused her passion and her experience to help kids in distress. The ranch, she thought, would offer an experiential treatment option to help break down the walls these kids build in more traditional treatment settings. That environment is a 45-acre tract of rolling countryside in southern Gaston County. A large red barn, home for the ranch’s dozen or so horses, anchors the property. Surrounded by open pastures and shady groves, and adorned with plenty of western accessories, the ranch is a photographer’s dream. Two covered arenas provide a safe place when bad weather makes outdoor work unbearable. That’s important because “crisis doesn’t wait for the sun to come out,” says Vanderbilt. When David first began visiting A Bit of Hope Ranch, he had to be physically restrained by a social worker. His unpredictably violent outbursts required it. Vanderbilt recalls the frustration of his first time on the ranch. “It was the slowest session ever,” she says. As is the custom at the ranch, David was first given the chance to choose the horse he would work with. 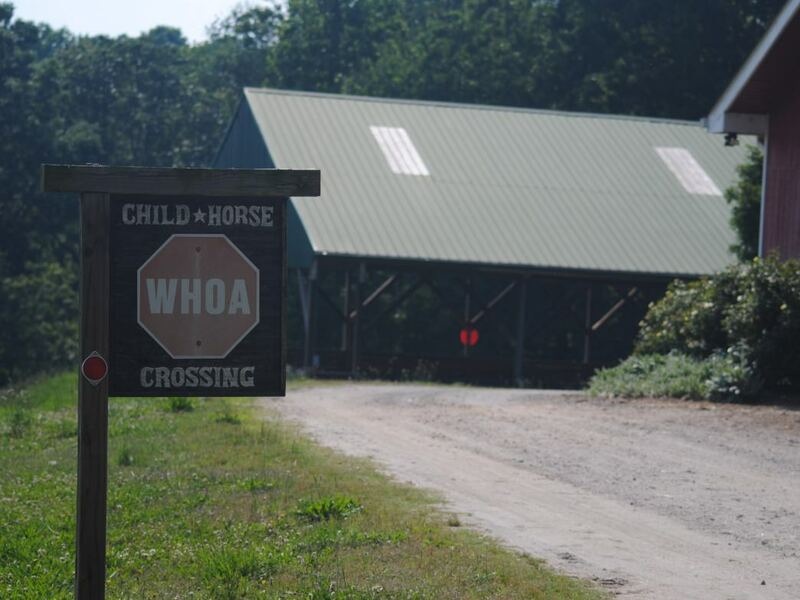 Each horse has its own “horsinality”, says Vanderbilt, and it’s amazing how often a kid chooses the best one for them. David chose Lilly, and for 55 minutes, the length of a typical session, he stood next to his horse, not saying or doing anything. Therapy sessions at the ranch are client led; it’s the actions and reactions of the client which dictate how the session will proceed. A mental health professional and an equine specialist read the horse and client to decide how things should go. For example, a kid might be given a task like building a square out of given materials and finding a way to get their horse to walk into it. 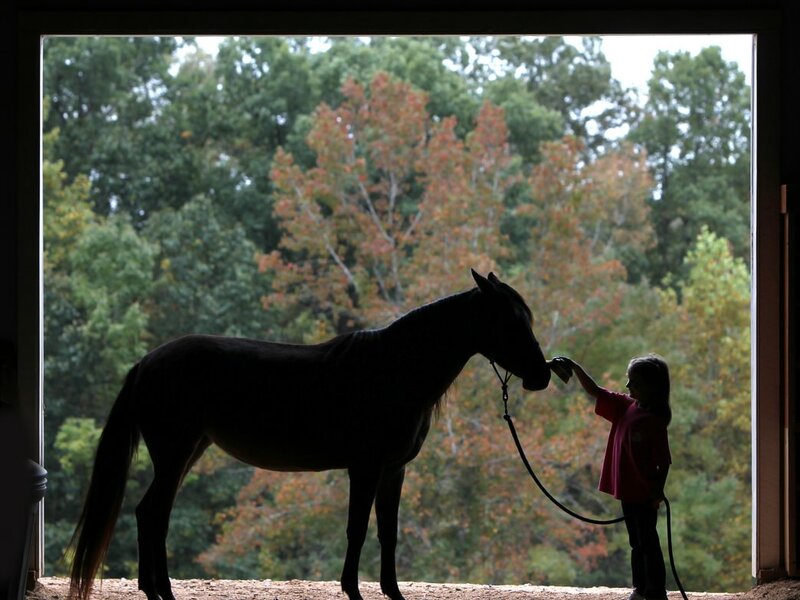 There are no ropes or halters, so the child has to convince the horse to do what they want it to do. Vanderbilt says around 80% of the work is done on the ground, not while riding. But these exercises aren’t about succeeding in the task. How the child approaches a challenge, how they react to stress and failure, is the golden nugget of information that the team is after. This is what often can’t be found in an office setting. Lilly is fairly unremarkable, as horses go. The mid-sized, middle-aged quarter horse is shy, happy to stay in the shadows, never really connecting with anyone at the ranch. Only on closer inspection is Lilly’s unique feature visible. The scars on her face are reminders of the nights when her previous owners would have a few too many beers and make sport of hitting her with a bat or with ropes. Even now, her skittishness towards anything resembling a rope makes her unrideable. The horses that come to the ranch have varied backgrounds. Some are donated after happy lives on other farms. Others, like Lilly, are not so lucky and come to A Bit of Hope after being rescued from bad situations. Those best-suited to the work will stay at the ranch. The others will be adopted out to vetted caregivers who offer them a good home. At the end of that excruciating first session, as David walked away, Lilly, the introverted quarter horse, followed him. He still didn’t say anything. Horses, it turns out, are very sensitive to the energy that people project. For a nervous or excitable animal, spending time around severely anxious children can affect them greatly, even giving them ulcers. But it’s also that sensitivity that makes the right horse an amazing partner in peering behind the walls these kids have built. David’s second visit to the ranch began much as the first, only this time he was assigned a task. In the middle of working through the job he was given, Lilly did something Vanderbilt had never seen. The horse stood next to David and wrapped her head around the boy. They both stood there for a long time. Kids like David are referred to A Bit of Hope from schools, church groups, The Sherrif’s office, the Department of Social Services, and by other therapists. Some might come from a great family situation but suffer from anxiety. They may only visit a half dozen times. Those with deeper issues may be at the ranch every week for a year. Each child enters the facility through an intake process. This takes place in a western themed office to help differentiate the experience from their typical therapy. In fact, the goal is to make it so visits to the ranch don’t feel like therapy at all. Even the land on which the ranch sits plays a part. “Walk and Talk” sessions make use of miles of trail which wind through shade trees and around the pond as a tool to get through barriers. Vanderbilt explains that on these walks heart rates, O2 levels, and naturally produced dopamine increase while stress levels come down. During David’s third session, the team brought two other horses into the mix. One of these horses was a gregarious and dominant animal. When that horse approached David, Lilly quickly became agitated. There was lots of tension, energy, and then an explosion. Lilly began kicking furiously at the other horse. David, in turn, became upset and started yelling. “Stop, stop, you don’t have to kick, you don’t have to kick, it’s OK,” he shouted at his friend. Shortly after this incident, David shared why he sometimes reacted like Lilly did. His father would hit his little sister. David, not knowing how else to stop his dad, would lay on his back and kick at him. Kicking became his defense when things didn’t seem right. David hadn’t shared that information before. This was the golden nugget needed to help him. Vanderbilt worries about the reputation of this type of therapy. She hopes that as awareness grows, they’ll be able to see kids earlier in the treatment process. “Equine therapy sounds like it’s out there, like it’s a little voodoo, so a lot of times it’s a last resort,” she says. There is, however, not only a great deal of science behind equine therapy, but work being done at A Bit of Hope will further the practice. Brianna Perkins is one of the licensed therapists working at the ranch and a PHD candidate. Her soon-to-be published papers are studies in the neurology behind the work they do. The goal is to use this research to create a playbook for other equine therapists. New programs expand beyond mental health and behavioral issues and include sessions for autism and sensory processing disorder. But the beautiful grounds of the ranch aren’t used solely for therapeutic purposes. Educational opportunities here are aimed at K-5 classes. The Cowboy Logic series introduces topics such as soil erosion, physics, the chemistry of a campfire, and simple machinery to kids in an interactive way. The farm setting has been an ideal site for weddings, birthday parties, and church retreats. An on-site low ropes course is the centerpiece of leadership training aimed at high school, college, and corporate groups. 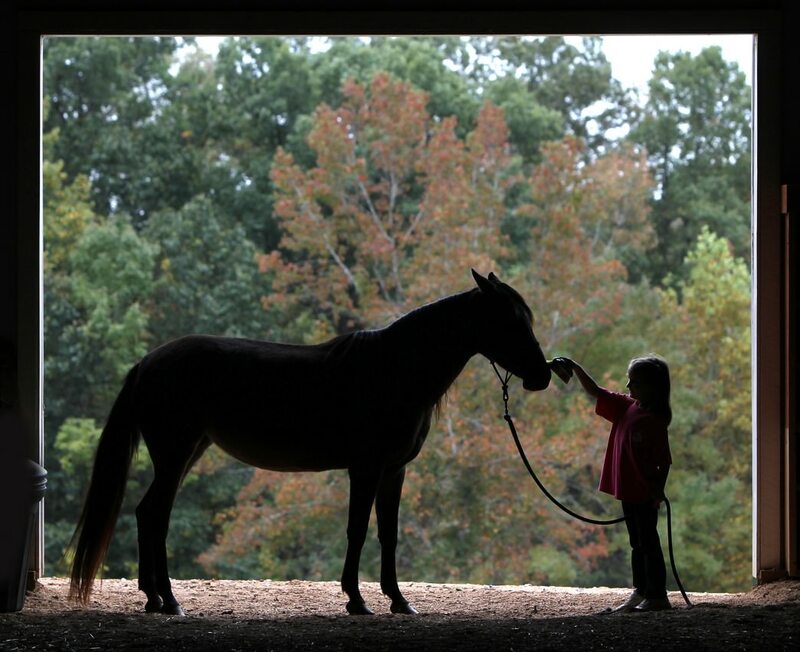 Of course, there are riding lessons and the horses are great facilitators for each program. David had an understandably bad view of relationships, says Vanderbilt. According to his therapist, this may have been the first healthy attachment he had ever made. This is the type of help Vanderbilt dreamed of facilitating in those early days and it’s exciting to see it happen. But while the work is rewarding, running an operation like this requires a lot of work, she says. Horses need to be fed twice a day, fences need fixing, and grass needs cutting. Fundraisers and event booths require staff and there’s always a need for mentors and group leaders. There is always a need for volunteers. Even a non-profit powered by volunteers needs funds to survive. While the ranch works on a fee-for-service model, it is the individual donations and grants that keep the doors open. Vanderbilt jokes that “despite my name, I don’t come from money.” Donating through Project Hope is an easy way to lend a hand. If this were a Disney movie, David would form an inseparable bond with Lilly, become a championship equestrian, and live happily ever after. But this is reality and a life of crisis can’t be solved in a two-hour run time. Success at the ranch is measured not at a gallop, but in small steps. The road for David, like many of the kids that come to A Bit of Hope Ranch, is twisted and full of blind corners. It’s difficult to see exactly what’s ahead for him. But he’s been visiting the ranch for almost a year-and-a-half now and physical restraint hasn’t been needed for a long time. He’s down to only one session every other month. And he’s been in a placement—a home—for four months. The longest stretch of his life. Originally written for Gaston County Gov.